Have You Referred a Friend for Breast Augmentation? If you have referred a friend for breast implants and they had the surgery with Dr. McCormack, you are eligible to receive a $50 American Express gift card through the LoveYourLook® MENTOR® MemoryGel® Breast Implant Referral program! 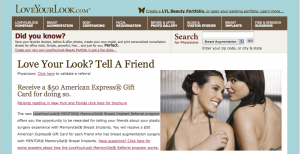 Signing up is easy – just go to www.loveyourlook.com/referafriend and complete the form so that you get your $50 reward. Word of mouth referrals mean so much to us. We appreciate it!! !